ADDRESS: 1803 Dax Court, Tallahassee, FL 32308. Off Miccosukee Road outside Capital Circle near the Capital Regional Medical Center and the Tallahassee Orthopedic Center. Northeast. Close to Bus Route 4- see the bus schedule. APPLICATION:Written Application for verification of Rental History, Employment and Income, Credit Report, etc. $50.00 Application Fee Per Person or Married Couple to process the Application. Application Fee is Non-Refundable. 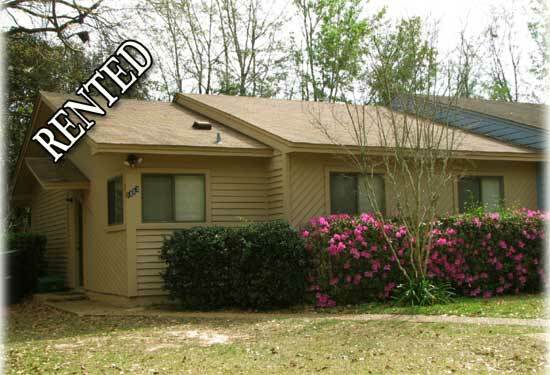 UTILITIES: Tenant must pay for all Utilities: City of Tallahassee, Waste Management for Garbage, Television, Telephone, Internet etc. Property Manager visits and changes Air Conditioning Filters Monthly. LIVING AREA SIZE & ROOMS: Living/Dining Combination with Vaulted Ceiling and Corner Brick fireplace: opens to Patio and Backyard. The unit is about 1140 Heated and Cooled Sq. Ft.
BEDROOMS: : Two Bedrooms. One Bedroom is the Size of Two Together. KITCHEN APPLIANCES: Range, Refrigerator and Dishwasher. AMENITIES: Ceiling Fans. Sky Light & Vaulted Ceiling in the Living/Dining Room Combo. Fenced Backyard. Two Parking Spots. Close to Shopping, Restaurants, Services, Hospitals and Medical Facilities.